Welcome Aboard IHC185™ Internet Horology Club 185 IHC185™ Discussion Site Main Page Open to the World RESEARCH FORUMS South-Bend Watch Company Research Forum It started with my grandfather's 223 "The Studebaker"
Hi everyone, my name is James Bauer, I am a new member here although I have been lurking for several months. 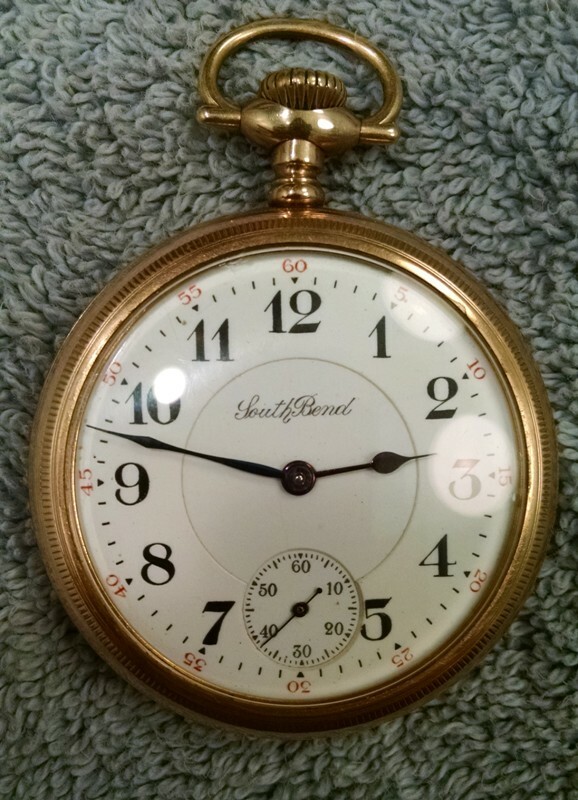 I thought I would introduce myself by posting a picture of my grandfather's 223 "The Studebaker" pocket watch. I hadn't seen this watch in thirty-five years, but rediscovered it while going through my deceased father's belongings last December. The serial number of 597556 places it in the second run of 223's, which were completed in 1909. The case is a Keystone 25 year 14k gold filled, screw back and bezel, inscribed "From Mother (my great-grandmother), 1914". I do not know if it was given at Christmas or as a birthday gift, but I am sure my grandfather never worked for the railroad. 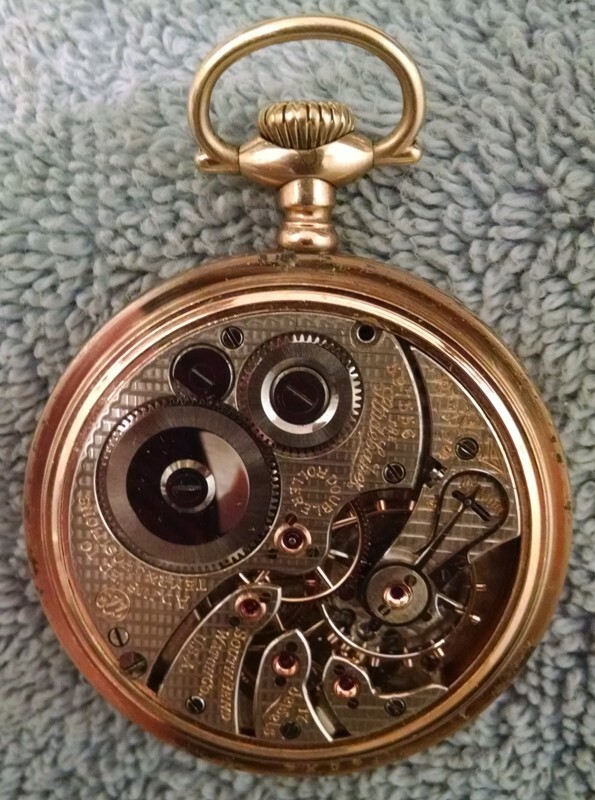 Since finding this watch and researching it's history, I have become fascinated with timepieces in general and South Bends in particular, and have managed to acquire several others, including a 227 (intended as a carry, arrived missing a case screw so I borrowed one from the 223 as shown in the picture), several 100 series movements, and a 431 (more pictures to come). Welcome aboard! What a beauty!!! Here is the face, the dial has one hairline between 10 and 11, but otherwise is in good shape. The hours hand is plum, while the minutes and seconds hands are blue, I have no reason to think they are not original to the watch. I have always found hobbies to be more enjoyable when I learn to do things myself, so I have been cleaning and adjusting (and breaking) some junk watches and movements I picked up on ebay. My formal training as a woodwind and brass musical instrument technician makes me comfortable with small parts and mechanical processes, (although watch parts are even smaller). I know I am just a beginner, but I feel like I have a pretty good grasp of the basics of cleaning, oiling, and adjustments, in large part due to reading the forums on IHC185, so thanks everyone! I have not cleaned the 223 yet, although I have successfully cleaned and oiled a few 0s movements and wristwatches, and my 227, so I think it is quite possible to do. Hope you enjoy the pictures, any comments or questions welcome. I look forward to interacting with the IHC185 community in the future. Welcome. What a great watch and a piece of family history. Usually, high grads of South Bend watches had plum hands so, its possible that with time someone replace it. We are on a similar arc of newly fascinated. Always enjoyed machines of all kinds,the historical aspect and wide variety makes these irresistible . Well put by Rafal, if you get that bug you are lost forever. Thanks for the welcome guys! As far as the cleaning bug goes, I agree, and I'm pretty sure it's too late to save me. As a fellow South Bend collector, welcome. Nice to have a good South Bend to have as a family heirloom too. I don't have that luck! Quick Reply to: It started with my grandfather's 223 "The Studebaker"